Clearwater Beach sand and water is like no other. And the amenities don’t fall behind either. My recent weekend, family getaway had two goals in mind – family fun and relaxation. Both were made possible by the warm gulf breeze and the turquoise sea. And that’s just outdoors. Upon entering the welcoming lobby of the Hyatt Regency Clearwater Beach Resort and Spa, we took in the beautiful décor and friendly staff. The only waterfront Hyatt on Florida’s west coast is inspired by the classic West Indies style. Every guestroom is a suite including walk-out balconies with water views. It is simply breathtaking to see the sun glisten on the waves. Inside the bedrooms are plush pillows and pampering linens on Hyatt Grand BedsTM. To our pleasure, we found a fully, equipped kitchen with granite countertops and stainless steel appliances. In all, there are 250 spacious suites, ranging from 600 to 2,000 square feet – enough room for a family on a mission to fun. Guests aged three to 12 will enjoy fun-filled days planned especially for the younger set, featuring interactive, educational and entertaining activities that ensure vacation truly is an experience for the whole family. Camp Hyatt is offered daily from 9:00a.m. – 4:00p.m. and on Friday and Saturday evenings from 6:00p.m. – 10:00p.m. Pricing for a full day is $80 (including lunch), or $40 – $45 for a half day (with or without lunch) and $50 for evening sessions, including dinner. The New Dali is an awe-inspiring installation of the Museum’s permanent Salvador Dali collection within the combined 20,000 square feet state-of-the-art gallery spaces. Specially designed salons surround the outer perimeter of the core exhibition housing the world-famous Masterworks. The salons offer visitors magnificent vistas of the paintings from various angles in ambient natural light. The two main galleries will have access to an alcove within the “glass enigma” giving guests a panoramic breathtaking view of Tampa Bay. Breakfast with Dali is a monthly event that introduces Salvador Dali and the Dali Museum to families with children (recommended ages 6-12).This fun and interactive tour is led by a Dali docent as well as a roster of junior docents who have chosen Dali paintings and other works which specially appeal to children. The tour is followed by a Spanish-themed breakfast buffet as well as hands-on activities. Cost: $21 per adult, $10 per child (6-12); Member admission: $10 per adult, $5 per child. Tropicana Field is the world’s only professional sports facility that features live cownose rays. The Rays Tank opened in 2006, and is located just behind the right center field wall. Through a unique partnership with the Florida Aquarium, there are over 30 rays that fans can touch and feed throughout the game. The 10,000 gallon tank is one of the ten-largest in the United States. Tropicana Field is home to a number of interactive areas for kids of all ages. In the Left Field Street area, fans can participate in a baseball-themed game show, take their picture on a Topps baseball card, and personalize their own jersey. In 2007, Right Field Street was renovated to include numerous activities for younger baseball fans. Kids can experience the magic of baseball in the Rays Baseball Carnival, a real working carnival that includes Tip-a-Jug, Ring Toss, and more. Frenchy’s Rockaway Grill offers open-air beachfront dining right on the Gulf of Mexico. The stellar sunset views are a perfect pairing to their large selection of fresh seafood, sandwiches, their famous She Crab soup and other Floribbean style dishes. Rockaway also features live music daily from the best local artists, a lounge area with games and pool tables. 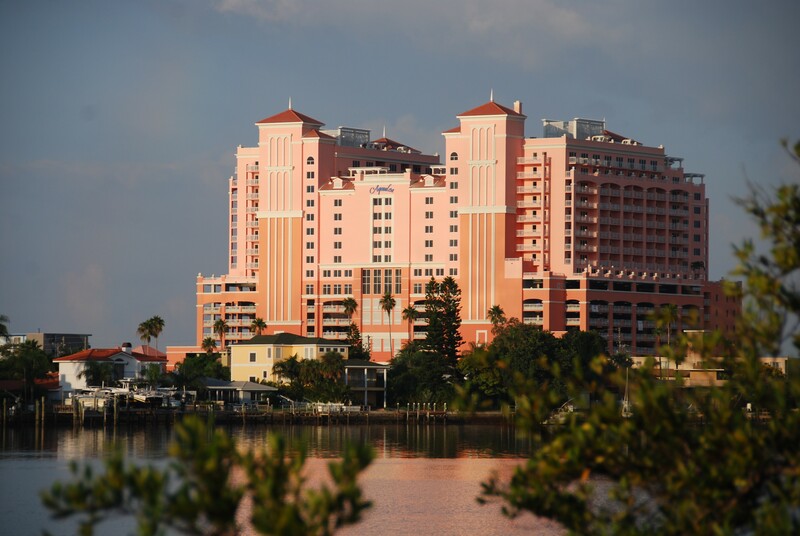 Previous Post Review//Gaylord Palm Resort: Old Florida Meets Shrek!